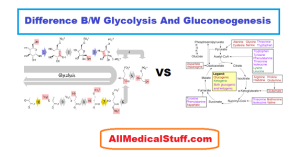 Glycolysis and gluconeogenesis are two pathways of glucose metabolism. One is breakdown of glucose while other is systhesis of glucose. Glycolysis is the breakdown of glucose up to formation of pyruvate (in aerobic conditions) or lactate (in anaerobic conditions). While gluconeogenesis is the synthesis of glucose from other then carbohydrates substances such as pyruvate, alpha ketoglutarate, gluconeogenic amino acids, lactate and gluconeogenic glycerol. Site of pathway of glycolysis is liver and muscles. While glyconeogenesis occurs in liver and kidneys. First step of glycolysis occurs in cytoplasm and generates only a small amount of energy while the rest of steps occur in mitochondria. While the first three reactions of glycogenolysis occurs in mitochondria and the rest in cytosol. Glycogenesis has two types i.e aerobic glycolysis in which glucose is reduced up to pyruvate which then enters kreb’s cycle and is further reduced. And another type is anaerobic glycolysis in which pyruvate is converted into lactate. While gluconeogenesis has not any sub-types. ATPs are produced in glycognesis while no ATPs are produced in gluconeogeneis. Gluconeogenesis only produce glucose at the end of pathway. There are three rate limiting and irreversible steps in glycoloysis. The enzymes involved in these three rate limiting steps i.e rate limiting enzymes are: hexokinase/glucokinase, phosphofructokinase and pyruvate kinase. While there are four rate limiting steps in gluconeogenesis. The rate limiting enzymes are : pyruvate carboxylase, phosphoenol pyruvate carboxykinase, fructose 1, 2 bisphophatase, and glucose 6 phosphate phosphatase. Overall as you can see glycolysis and gluconeogenesis is totally opposite to one another. One is the breakdown of glucose while in other glucose is formed. Hence the enzymes etc are totally opposite as well in each step. 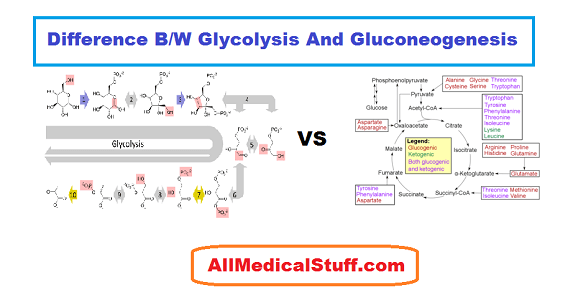 Some other differences and similarities between glycolysis and gluconeogenesis are also explained above. These are the main 6 points and are enough for a medical/biochemistry student for exam point of view and general knowledge as well. Zainab you’r wrong that’s not interesting… But it’s more interesting. thanks…that was my mistake. fixed. Nice article, loved reading it, without any confusion.